Halfway through the waterlogged kookiness that is Aquaman, I half expected the title character to announce that he lived in a pineapple under the sea. 2018 was a good year for movies. Here are the best ones. Jason Momoa, Aquaman and longtime Flyers fan, talks about a career that’s going swimmingly. Verily, the new heavily animated DC installment is like an Avatar-ish episode of SpongeBob SquarePants (you can talk under water, and walk the seafloor like it’s Broad Street) that stars Jason Momoa and is 143 minutes long. Why attempt such a thing? The answer is in the $200 million Aquaman has already made in foreign territories before its U.S. bow. It’s fluent in the international language of spectacle, no matter how nonsensical and goofy. And to be frank, a little goofy nonsense is a welcome change of pace from the glowering, self-serious murk of the Zack Snyder Justice League movies, with their grimacing cast of misanthropes. Momoa looks relieved to be away from all the moody superhero bickering, and eager to add a smile to his DC Universe scowl. This he does right away, roughing up a bunch of pirates, in a scene with as many punch lines as punches. From there, we get a quick rehash of his origins story: Dad (Temuera Morrison) is a lighthouse keeper, mom (Nicole Kidman) is queen of Atlantis and swims off soon after he’s born. Aquaman settles into his life as an Altantean/human hybrid, caught between two worlds but not all that bummed about it. He likes it topside, especially the Guinness. There’s a funny scene at a dive bar, Aquaman drinking from a giant tankard and facing down some potentially troublesome thugs (hey, aren’t you that fish guy?) in a scene that ends brightly, and highlighting Momoa’s way with a joke. His easygoing demeanor contrasts interestingly with his imposing frame and booming voice, the latter attributes more becoming of a future king. This feeds into the movie’s plot, which is like Mary Queen of Scots dropped into an aquarium. 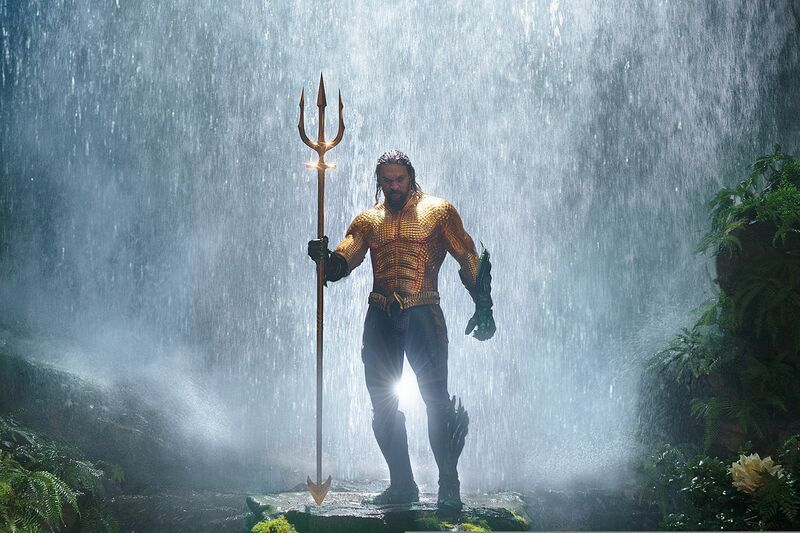 Aquaman is one potential heir to the throne of Atlantis, currently occupied by his half-brother Orm (Patrick Wilson), an uptight power-hungry weirdo who wants his rival vanquished or dead. “Call me … Ocean-Master!” the miscast Wilson warbles, in a way that ensures no one will ever call him that. Other undersea factions fear Orm’s mad desire for power. So the resistance recruits the reluctant Aquaman to stand in opposition. Most persuasive is Atlantean princess Mera (Amber Heard), who takes him to find a decisive and powerful trident, which for some reason is located in a desert. Then it’s back underwater for an exceedingly long battle for control of Atlantis, featuring every sea creature known to science, and a few more. Every superhero movie seems fated to end this way, an endless, weightless, animated rumble, where meaningful physical reality is abandoned, and the outcome never in doubt. At least Aquaman has a different palette, and new shapes to work with. It’s still ultimately silly and dreary, and will test the endurance of fans who then must withstand an even longer credit sequence to get a whiff of the next DC story wrinkle. As for Aquaman, the world has spoken, and there will be Momoa to come. Directed by James Wan. With Jason Momoa, Patrick Wilson, Nicole Kidman, Amber Heard, Temuera Morrison and Willem Dafoe. Distributed by Warner Bros.